I was in a little slump, but I think I'm finally getting out of it. BEAUTIFUL color scheme - love it!! It IS beautiful, Nicole :) I am loving it TOO!!! It's looking beautiful. So glad to here that it is a joy to stitch. You'll have it done in no time. I am trying to resist Miss Woodham but these colors are wonderful! It looks great, Nicole! This is one of my favorites on my wish list! what fabric did you use? It is very pretty and old looking!!! So beautiful. I would like4 to try this one!!! Goodness, those colors are beautiful! Sarah Woodham is just really pretty Nicole and your stitching is just lovey! I am so glad you had fun in Florida and are back! 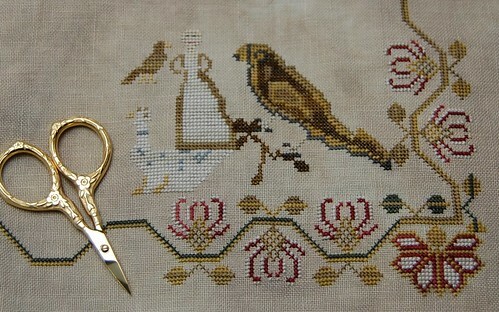 I miss you and just love seeing your great progress on this beautiful sampler!! Amazing project. I love it. OMG your work is exceptional. I came across your blog by accident and I am happy I did. Your photos and your work is soooo good. Beautiful wip, I just love the colours! Sarah is gorgeous, Nicole; bald or not! Well, if this is what a stitching slump looks like, then I'm in need of one. Your progress is outstanding, and now, not only do I love the border, I love that bird, too. Great color scheme, and beautiful stitching as always, Nicole. How did you get out of your slump Nicole. I need advice!!! I've been mired in my own and it's making me nuts. Sarah looks wonderful. I can see why you're having fun stitching it. It's so pretty. I've been eying this sampler, and I think you have definitely pushed me over the edge! So pretty. Oh such beautiful colours. One day I will start mine. In the meantime I'll enjoy seeing yours. Can't remember if I'd commented on your new stash acquired recently - very lovely samplers! It's gorgeous! I look forward to seeing an update soon. Beautiful, Nicole!! And I see you are listening to Lady in the Tower..how's that? I downloaded a sample of that one to my nook and wonder if it's as good as what little I got to read. Your stitching is always so neat and beautiful! The silks are gorgeous. where can I get this pattern? I have seen it but cant find out where to purchase. 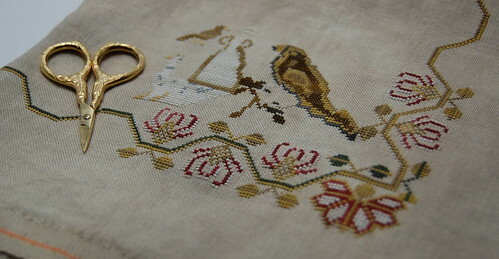 That piece is lovely - I especially love the border! I can't wait to see more progress on this!